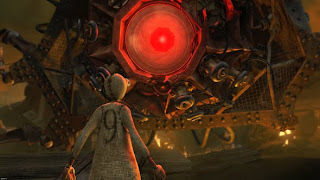 The best scene in director Shane Acker’s post-apocalyptic animated adventure 9 occurs in the film’s opening minutes, with the quiet awakening of its titular gear-powered hero. Hanging from one arm by a lean, weak piece of string, the fragile little creature abruptly breaks loose, falling clumsily to the worn wood surface of a workshop table. As he inelegantly pulls himself to his feet, tiny camera-lens eyes softly clicking and whirring, taking in this strange new world around him, there is a real sense of discovery taking place. This isn’t simply a collection of pixels we’re seeing stretch its tiny puppet-like fingers and cautiously zipping up its exposed abdomen, but a living thing who instantaneously stirs within us deep-rooted feelings of wondrous enchantment. Over the course of but a minute or so, we come to understand this curious diminutive being and become wholly invested in both his future and the mysterious universe around him. If only the film’s screenplay shared our inquisitiveness and astonishment, we may have really had something special on our hands. Alas, despite the odd-ball beauty glimpsed in t his delightfully involving introduction, new-fangled ideas are at a base minimum in 9, a visually rich, yet underwhelming spectacle that favours derivative action movie tropes and one-note characterizations over creative invention and depth. 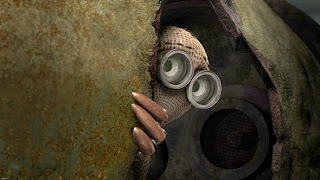 Perhaps we’ve been spoiled by Pixar’s apparently bottomless wellspring of artistic marvels, observed at its most potent mere months ago with the triumphant Up, but a film bearing the names of cinema’s premier fantasy goth-father Tim Burton and current hyperkinetic hot-shot Timur Bekmambetov, mastermind behind last summer’s Wanted and the Russian cult hits Night Watch and Day Watch, attached as producers shouldn’t feel so sluggish and, well, ordinary. 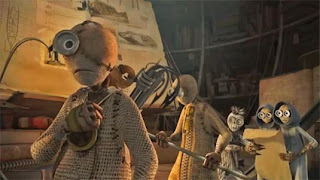 You can’t blame them for rolling the dice on Acker though, who attempts to expand his clever 10-minute Oscar-nominated short to full-length, giving “9” a voice through Elijah Wood, and plugging him into an adventure which requires the brave miniature “stitchpunk” – a term used exten sively in pre-release press-notes, but unmentioned in the film – to battle a relentless horde of manufactured doom-machines for possession of a powerful life-giving talisman. Journeying over the war-scarred remnants of a decimated Earth, which was annihilated by biological warfare and towering War of the Worlds­-style walking weapons unleashed by a fascist dictator, “9” comes into contact with a handful of fellow “stitchpunks”, including domineering wannabe ruler “1” (Christopher Plummer), one-eyed survivor “5” (John C. Reilly), mentally scattered idiot savant “6” (Crispin Glover), and valiant feminine warrior “7” (Jennifer Connelly). Forced together, the rag-tag group of clothe-and-clockwork crusaders must place their differences aside and band together to trounce the massive marauding robo-octopus (which bears an unmistakable resemblance to Aliens’ towering queen Xenomorph) hot on their collective trail. Acker fills his dusty movie wasteland with jagged shapes and ugly, crumbling structures, where only the faintest of light filters through the rusted scrap-metal ceilings. Indeed, there is an impeccable craftsmanship to the rich visual world of 9 which recalls the desolate ominous environments of the Mad Max films. 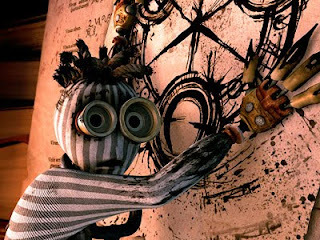 Similarly, each of the “stitchpunks” has a unique look and feel to their design and motion, an achievement which helps surmount the flat and distractingly clean-sounding voice-work (a little distortion and grittiness would have felt more organic), and helps us differentiate them from one another when the chaos begins to reign. 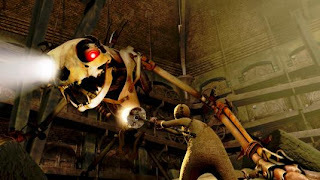 The clomping, stomping villains are also highly detailed constructions, bearing recognizable animal body-structures akin to spiders, cobras, crabs, pterodactyls and fireflies, and made up of revolting fragments of bone, metal, wire and junkyard refuse. Make no mistake; as a pure exercise in animated design 9 works, and director Acker’s attention seems solely focussed on the most m inuscule details – there’s a particularly chilling second-long shot into the front seat of a car, where the petrified corpses of a mother and child remain eternally locked in a frightened embrace – but he seems more or less ambivalent about the trajectory of his film. The plot meanders when it should soar, and never settles into an engaging rhythm (it’s never good when movie-goers are checking their watches in a 79-minute movie). By the time the admittedly well-crafted heartfelt ending rolls around, it was hard, even for this historically easy mark, to raise much more than an iota of warmth for these sewn-up ciphers. 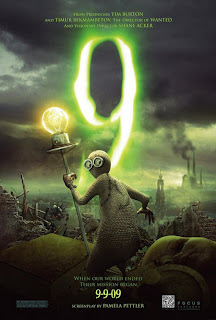 Arguably 9’s worst problem, however, is that its near impossible to discern who the potential audience for the film is, as it is far too grim and intense for chil dren, yet features a dull, shallow script and protagonists too juvenile for adults. So it remains stuck in a weird limbo, revealing dazzling bits and pieces only during momentary breaks in its formless storyline and impressive-but-wearisome action sequences. Despite good intentions, 9, like its cute central character, feels shabby and confused, a work-in-progress that’s escaped into the world before it was truly ready. Too bad. *Originally printed in SFU's The Peak: Sept 14th, 2009.